Double hat trick hero - Natural Star Nani and successful producer Dil Raju collaborated for a film ‘MCA’ under 'Sri Venkateswara Creations' banner. Sai Pallavi who was introduced as Bhanumathi for Telugu audiences with Sekhar Kammula's super hit film Fidaa is lead actress in MCA. Sriram Venu is directing the film which is co-produced by Sirish and Lakshman. The film’s entire shooting part has been wrapped up except for couple of songs. 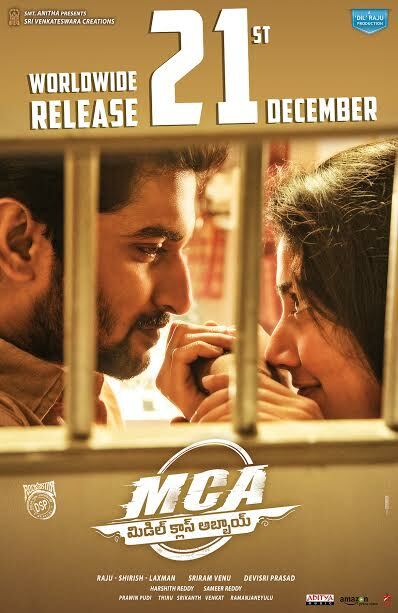 MCA is all set for worldwide grand release on December 21st. Nani, Sai Pallavi, Bhumika, Vijay, Senior Naresh, Amani etc. are prominent cast in the film for which dialogues have been penned by Mamidala Tirupati and Srikanth Vissa. Here is other technical crew- Art Director: Ramanjaneyulu, Music: Devi Sri Prasad, Cinematography: Sameer Reddy, Production Banner: Sri Venkateswara Creations, Producers: Dil Raju, Sirish and Lakshman, Story, Screenplay, Direction: Sriram Venu.